Pillow Fight in San Francisco! This just in from an anonymous source…making its way back around to the US, a massive Pillow Fight is being planned for 6pm on Valentine’s Day (February 14th) at San Francisco’s Justin Herman Plaza (at Market and Embarcadero). 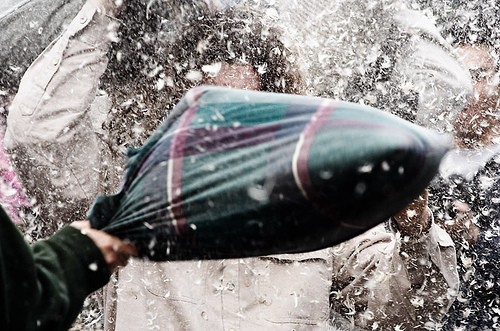 Here’s more on the history of Pillow Fight Club. UPDATE: The San Francisco Pillow Fight 2006 was a huge success! Photos are now online.